Cacti are special in many ways. Many people think that cacti live in deserts. Nothing can live in a real desert, but 'desert' cacti are adapted in many ways to live in dry and sometimes hot places. Globular cacti – a round shape means less surface area to lose water through evaporation. 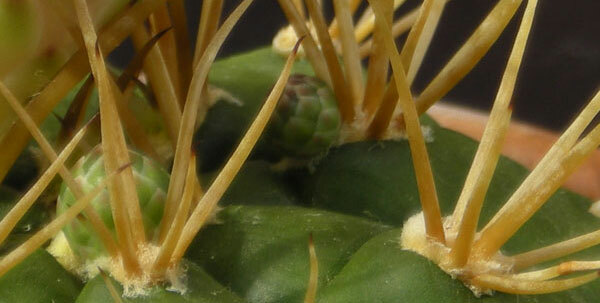 Many cacti, both globular and columnar, are ribbed. This means that the plant body can expand quickly to take in water when it is available. The ribs also provide some shade to the plant body. Many cacti have a thick, tough skin (or epidermis) with fewer stomata (or breathing pores). In addition some are covered by a waxy or oily bloom. Both of these features helps to reduce water evaporation. Some plants have tuberous roots for water storage. Others have a wide system of shallow roots, which when it does rain can absorb water from a large area of the ground. Many cacti have spines, which provide shade and protection from hot sunshine. A thick covering of spines like these on the right will also help to prevent the plant from being eaten. And finally – what makes cacti different from all other plants? All cacti have areoles. They usually look like small cushions of bristles from which the spines and buds are growing. The spines grow from the back of the areole and the buds from the front. No other plant has areoles – they are unique to cacti. 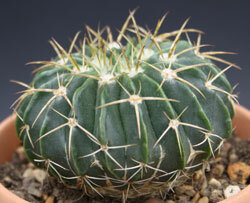 Some other succulent plants have spines, but if they are not growing from areoles, then they are not cacti. 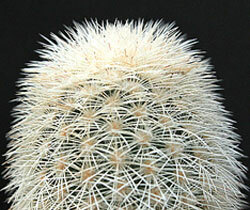 See our Spiney Gallery for pictures showing how spines and areoles can make cacti really special.